10TB is a gigantic amount of storage, but the size is not the biggest bit of news with WD’s announcement today. That would go to the use of perpendicular magnetic recording (PMR) in this Helium filled monster — which means that when combined with 7200RPM means that it should perform like a normal hard drive instead like slowly like its shingled magnetic recording (SMR) competition. Saw this news on Ars Techinca, and there’s also some good stuff on the next gen HAMR technology so well worth the read. Western Digital’s HGST division has released the world’s first helium-filled 10TB hard drive for everyday use—assuming you have about £600 burning a hole in your pocket, anyway. Meanwhile, despite reiterating that it would have a 10TB drive on the market this year, Seagate hasn’t yet moved past the 8TB mark. 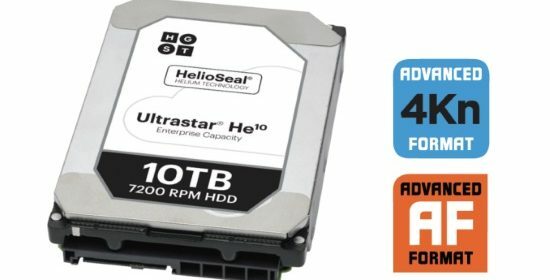 The Ultrastar He10 is notable for two reasons: it’s hermetically sealed and filled with helium, which is still a rather novel idea; and it has seven platters crammed into a standard-height 25.4mm (1-inch) hard drive.